Home eXtreme botany Fascination of Plants Day at University of Reading – What do plants do for us? Did you know it’s “Fascination of Plants Day” (FoPD) on Thursday 18th May? Fascination of Plants Day is the International Day for everyone to celebrate the fascination and beauty of the plant world and the importance of plants in our lives and for the sustainability of the biosphere! 2017 finds the fourth international Fascination of Plants Day launched under the umbrella of the European Plant Science Organisation (EPSO). The goal of this activity is to get as many people as possible around the world fascinated by plants and enthused about the importance of plant science for agriculture, sustainable food production, horticulture, forestry, and all of the non-food products such as paper, timber, chemicals, energy, and pharmaceuticals as well as for conservation of global biodiversity. For FoPD at the University of Reading we are inviting local schools to come and discuss the question: What do plants do for us? Scientists say there could be as many as 400 000 different species of plants in the world! That’s a lot of plants, so we will asking: What different kinds of plants are there? Where do they grow? Where DON’T they grow? How do we use plants? and, could we survive without plants? School groups will attend and take part in activities co-ordinated by Dr M and colleagues at the botanical garden on campus and in the tropical greenhouse. They will be amazed by the beauty, variety and value of plants on the Reading campus and in the whole World! What other plants play a similar role in our lives? When you have finished all twelve look at the list and think if there are any other ways in which plants are important in our lives and in the whole world? The idea of this task is to get you thinking, don’t worry about getting exactly the right answer, in fact there may not be exactly the right answers or there may be more than one answer. The point of this little botanical exercise is to think about the plants and discuss the different ways in which we use these and other plants in our lives and to think also what our lives would be like without plants! 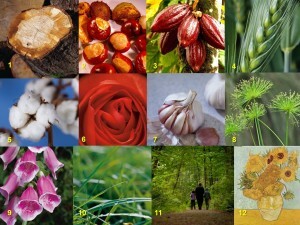 Dr M says: When you have had a think, check here for some more information on these twelve fascinations of plants!